Welcome to Tradewinds Tackle on Beautiful Ocracoke Island ! Ocracoke Island's retail shop for all fishing, boating, crabbing, and clamming supplies. Enjoy affordable and exciting fishing while on the island with help and supplies from our staff at Tradewinds Tackle. While on the island, come by the shop and share your fishing photos or text them in for bragging rites on our board. Check out our recent island catches below. With the warmer weather the past week, the large red drum have showed up along the beach for those fishing large chucks of cut bait. There are still nice catches of puppy drum on cut bait and lures. There also have been a few seamullets, small bluefish, and puffer fish. In the bad weather the dog sharks have persisted. Receive unparalleled service, fishing tips and saltwater fishing gear from Tradewinds Tackle. We are dedicated to helping our customers enjoy their outdoor adventures on the Outer Banks with the best fishing tackle and outdoor apparel. 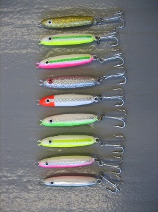 Shorelure surf darts are the perfect lure for blues and Spanish mackerel! Find All Your Outer Banks Fishing Needs With Us!